OXFORD, Miss. 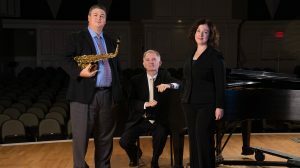 – Three University of Mississippi music faculty members have released a new album of material by French composer François Rossé. Adam Estes, assistant professor of music, is the lead performer on saxophone, accompanied on piano by Stacy Rodgers, professor of music, and Amanda Johnston, associate professor of music. “François Rossé: Métissage” is on the MSR Classics record label. Rossé is considered avant-garde because of his distinctive techniques for playing instruments that break from tradition. Knowledge of contemporary music and training is essential to perform Rossé’s work, Estes said. Recording is essential to music research and scholarship, and Rossé’s music is Estes’ primary research interest. Releasing an album of the composer’s music has been a longtime goal, Estes said. Estes also had an opportunity to interview and collaborate closely with Rossé in efforts to better understand the work and assist other musicians to perform the “dramatic and demanding music,” he said. This album is Estes’ fourth; he has done two solo recordings and two with his quartet, the Assembly Quartet. This is the first album that Estes and Johnston have recorded together, but the second between Estes and Rodgers. “I am very excited about the release of our album and was honored to be asked to play two pieces by François Rossé,” Johnston said. She typically performs with singers and enjoyed changing things up a bit to perform two pieces of Rossé’s works, Johnson said. “It is always a pleasure working with Adam Estes, who is a consummate musician and exciting performer,” she said. Estes and Johnston are also both part of the 2017-18 Southeastern Conference Faculty Travel Grant Program. They traveled to the University of South Carolina, where Estes graduated, to perform a guest artist recital in September.